During a performance on NBC's Late Night With Jimmy Fallon show, Squeeze pianist Stephen Large broke into one of the most unlikely piano solos for a band formed in the 70s: he played it on an iPad running Pianist Pro. "When I first saw the footage, I was blown away with what an accomplished musician could do with a touchscreen piano," says Mark Terry, the app's developer. "There's no greater thrill for the creator of a musical instrument than to hear it being used by a skilled musician." And while that performance may have been the most high profile use of the iPad for music in web coverage terms, it's not an isolated incident. Though perhaps not as proudly touted by Apple as the gaming and educational achievements of iOS, music apps have been a staple of the App Store since day one, initially as a novelty but now with enough clout to make major manufacturers, producers and artists take notice. Mark Terry's company, MooCowMusic, is a perfect example of this. Debuting with the fun, but hardly professionally oriented, Band for iPhone, it now boasts four iOS apps that could easily be applied to a professional's practice and production arsenal. "The electronic music press loved Band, but wanted much more functionality, often unfairly comparing it to Cubase or Logic, which leads the app designer to a quandary," says Terry. "Most users don't want to read instruction manuals and expect to be able to use an app immediately. If an app is too complex – if it requires reading instructions – then they're likely to give up and give it an unfavourable review. This is partly due to the 'throwaway' pricing of iPhone apps. "But once they start using the app, they demand more functionality – ultimately, in the case of a music app, to the level of a full-blown application such as Logic Pro." While Band still remains a favourite, it's joined by Guitarist, Bassist and Organist, all of which sit in the upper echelons of the App Store's music app chart. "After the success of Band, my sights were set higher to please the music press with their 'not Cubase' comments, and to aim for professional musician users who would take the 'iBand' concept further. "Unfortunately, I fell down that slippery slope of functionality (the downside of working with no external deadlines) and spent over a year writing 'the definitive music app', which was ultimately shelved because the user-interface was getting too complex. "Luckily, the technology behind the app wasn't wasted and allowed me to develop Pianist Pro for the iPad in the very short time that Apple gave us from [the iPad's] product announcement to launch." 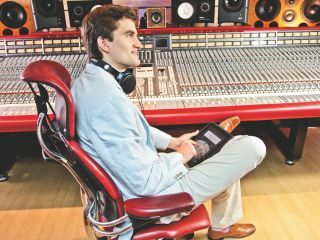 Mark's hard work paid off: Pianist Pro is one of the most popular iPad music apps and regularly hits the top spot on international App Stores, especially following the kind of publicity garnered from events such as Squeeze's Fallon appearance. A Google image search for the word 'piano' brings up an image of Pianist for the iPhone as the third hit; impressive for an app that didn't exist three years ago. Mark Terry's success doesn't end there, however. Evan Taubenfeld, guitarist for Canadian pop-rockstress Avril Lavigne and an artist in his own right, also makes use of MooCowMusic's digital keyboard. "Pianist Pro is simple and straightforward to use," he says. "It's like carrying a piano or synth with me everywhere I go." While portability is certainly one of the iPad's major benefits for musicians, the way it interacts with an existing computer setup is another asset for the recording artist. "I start a lot of ideas in Pianist Pro and then email myself the MP3 and begin to build in Pro Tools HD or Logic Pro," says Taubenfeld. "What's cool is that after I'm back on my Mac Pro, the iPad still serves a number of other functions." Making use of Wi-Fi and Bluetooth connectivity, the iPad can be used as both an additional display and a dedicated control surface for desktop music software, and Taubenfeld harnesses these abilities when recording. "I use Air Display for pushing lyrics into the vocal booth, as opposed to a traditional music stand, and use AC-7 Pro as a control surface in Logic and Pro Tools for mixing, muting, punching, playback and automation. "Basically, the iPad stays around the studio after I've transitioned to using a fully fledged DAW (digital audio workstation), because it's the ultimate utility and can serve a million different purposes." Artists have begun taking advantage of the iPad's feature set, wealth of apps and its portability to improve the way they work. Taubenfeld feels this is just the beginning of the relationship between artist and iPad. "Technology has finally bridged the gap between portability and quality, especially with respect to being able to make music anywhere without limitations. For writers, we have apps that do pianos, synths and drum loops. Almost every lyricist now uses computers anyway, so the iPad is easier to take around and write ideas out on. "Performers can make use of things like iRig, iElectribe and many others, so I think it's just about finding the right apps to fit your needs." The combination of respectable music creation platform and networked accessory makes the iPad a very attractive device for musicians. It's exciting enough to be able to plot beats, record riffs and even bang out live solos wherever you may be, but it's the continual development of apps to fill gaps in the music-making market that adds the weight. Evan Taubenfeld is the poster boy for this new wave of tech-centric artist, using the iPad not only for generating new ideas, but building on them in the studio with the device at his side. The versatility of controlling professional music software from the iPad's screen and viewing lyrics when recording vocals are surely what Steve Jobs originally envisioned for the iPad's future as a device suited to any possible discipline. "When I completed my last album, the iPad wasn't out yet, but I've used it a ton on all the new material," says Taubenfeld. And what, if any, changes would he make to the iPad's feature set? "Tech spec-wise it would be nice to have a USB input/output for connecting to a computer and using the iPad as a traditional MIDI controller, and also being able to connect MIDI controllers to the iPad for laying down more complex ideas." Since we spoke to Taubenfeld, iOS 4.2 was released and turned out to have MIDI support, satisfying yet another need for musicians.